Atlas chorus 2 2012 Set in area of outstanding natural beauty, small wooded site on privately owned farmland 200 yards from beach, spectacular views from Arnside Knott. All mod cons, beautiful decked area and private gardens. 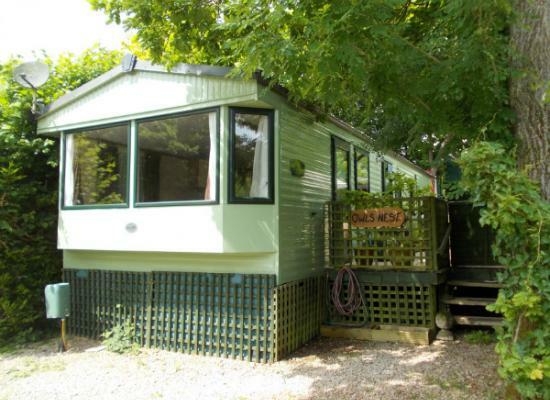 This is a beautiful , modern 6 berth caravan on a private woodland caravan park, set in an area of outstanding natural beauty. New Barns Caravan Park is sited in an area of natural beauty close to a beach, woodland walks and scenic countryside. The holiday park is located close to the village of Arnside where you will find a number of amenities including 2 pubs, bakery, cafe and other useful shops. The static caravans on this page are privately owned but are available to hire as holiday accommodation for your next holiday at the New Barns Caravan Park. As the holiday homes are privately owned you often get a much better quality of holiday home than if you were hiring from a holiday park direct. While enjoying a holiday at New Barns Caravan Park there are numerous attractions in Lancashire just waiting to be explored. These include Silverdale nature reserve, Leighton Hall, Sizergh Castle, Kendal, Windermere, Kirby Lonsdale and much more.